Leave to Remain is Abbas El-Zein's award-winning memoir of his youth in Lebanon and his years of travel between the Arab and Western worlds. It is powerful and poetic, passionate and elegiac, a clear-eyed and heartfelt examination of the forces that have shaped both his own life and a great deal of ancient and recent history. In Leave to Remain, El-Zein tells his story of growing up in civil-war Beirut, a city in the throes of self-destruction, yet obstinately clinging to its cosmopolitan past. El-Zein traces the genesis of a contemporary Middle Eastern identity – his own – under the influence of culture, religion, history and places far removed from where he grew up: Najaf and Baghdad, Paris, Palestine, London, Sydney and the American Far West. With him we travel through a Middle-Eastern life with an eye on the mundane and the everyday, as well as the cataclysmic events overshadowing them – from the adventures of an ancestor fleeing Ottoman armies during the Napoleonic wars to the trans-national world of Islamic scholarship in which his grandfathers lived, from the Israeli invasions of Lebanon to the Iraq war and the post-September 11 world of today. Leave to Remain is a story of a troubled homeland, of many departures and less-than-happy returns – an autobiographical reflection on today’s Arab world and its relationship with the West. 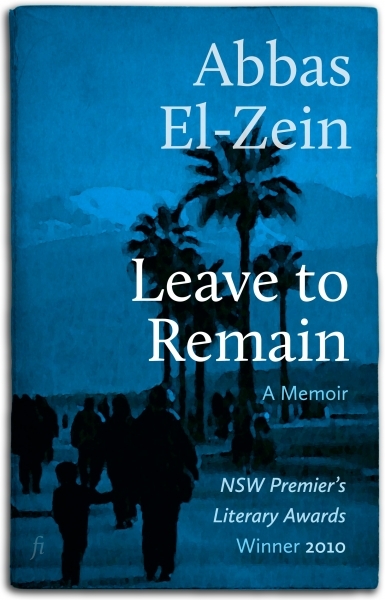 Leave to Remain won a NSW Premier’s Literary Award in 2010.